Aled Jones introduces a festive Songs of Praise celebration from London's Royal Albert Hall, as five thousand voices raise the roof with carols galore. Browse content similar to Christmas Day Big Sing. Check below for episodes and series from the same categories and more! for our Songs Of Praise Christmas Day Big Sing. 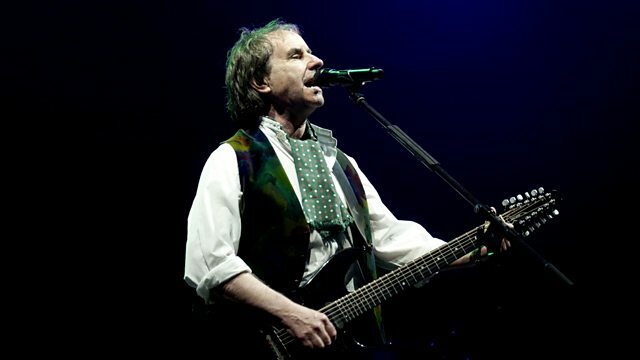 Our superstar guest is singer-songwriter Chris de Burgh. There's a special performance by our Junior School Choir of the Year. And a festive favourite, Walking In The Air. I'm sure I recognise that bloke from somewhere. And of course, a whole host of much-loved carols. Hello, and a very merry Christmas to you. -Are you ready to sing, ladies and gentlemen? the birth of the baby Jesus. It's Joy To The World. Well, that was fabulous. What a glorious way to start. You are in fine voice. and performed a staggering 3,000 concerts all over the world. Ladies and gentlemen, boys and girls, it's Chris de Burgh. like Christmas trees and Christmas cards. What do you feel about Christmas? Love it? I love the tradition, yeah. And I think it's wonderful for people to come together. and do not have friends and family around them. So maybe you could make a point and go and visit somebody today. -What are you going to sing? called On A Christmas Night. "Come outside, we'll play snowballs." and they join a Christmas celebration at Midnight Mass. singing On A Christmas Night, the one and only Chris de Burgh. # When the people saw us They said, "Come inside"
and I'm sure Father Christmas did what he does best. and included such things as cakes, fruit and nuts. Try telling that to my children! Well, our next carol mentions children and toys. Malcolm Sargent wrote the words. He was probably the best-known of the Proms conductors. at the Last Night of the Proms. Ladies and gentlemen, it's Zither Carol. 2011 has been a very exciting year for our next guests. they were crowned Junior Champions, the first-ever Welsh choir to win. singing Little Donkey, Little Jesus, Ysgol Pen Barras! Llongyfarchiadau. Wnaethoch chi fwynhau hwnna? -the rest of the interview in English. Fair enough. What's it like, singing with your friends in the Royal Albert Hall? It feels amazing. I was so lucky to perform here. It's not very often you sing on Christmas morning, either! "Been there, done it, ticked it!" What are you doing next? You've sung at the Albert Hall, there's nothing else to do! so we've got to do a lot of studying. That's reality for you, ladies and gentlemen. -Are you going to carry on singing? and I'm so pleased you won the Junior Competition. Ysgol Pen Barras, ladies and gentlemen! We associate bells with Christmas, don't we? written in 1924 by English composer George Ratcliffe Woodward. our Big Sing Orchestra, under the baton of Paul Leddington Wright. It's Ding Dong Merrily On High. the Adventist Vocal Ensemble and the Brighton Festival Chorus! And now something that has become synonymous with Christmas. You're bound to have heard it whilst buying presents. A Spaceman Came Travelling. To perform it, the man who wrote it. Please welcome back Chris de Burgh. I've spent many hours with you, but I've never asked - what inspired you to write it? on a hot August afternoon. So the answer is, I have absolutely no idea! But really, in the back of my mind, I'm a "What if?" person. and the crazy things that we do from time to time? about how to put the whole thing right. the chances are you're going to hear this quite a bit! but I can't wait to hear it now. Chris de Burgh. # "And I bring a message for mankind to hear"
# "This song will begin once again..."
# "..To a baby's cry"
Ladies and gentlemen, Chris de Burgh! Time for us all to sing together again. following a pilgrimage to the Holy Land. that he wrote the beautiful O Little Town Of Bethlehem. became an overnight success story that has lasted until today. and the song in the film, Walking In The Air, was written by our next guest. First things first, Howard. Thank you for giving me a career. You deserved every bit of it. and Walking In The Air. How did you get involved in The Snowman? "with no words, just let me see, let me do a little demo." and we'd no idea it would be such a big hit, really. and I said, "Would you mind turning that down a bit?" He said, "You should listen to this, mate," he said. And I said, "Well, actually, I wrote it,"
and he turned right round and said, "yes, and I'm Father Christmas". what I think is the greatest piece of music on Earth! Howard Blake! Ysgol Pen Barras and Howard Blake, ladies and gentlemen! but our thanks to Chris de Burgh, Ysgol Pen Barras and Howard Blake. under the title One-Horse Open Sleigh, have you guessed what it is yet? It is, of course, Jingle Bells. From all of us on Songs Of Praise, have a very happy and peaceful Christmas. for our New Year's Day Big Sing. Our special guests will be Alexandra Burke and Katie Melua. so why don't you, too, as we celebrate the dawn of a new year. Aled Jones introduces a festive Songs of Praise celebration from London's Royal Albert Hall, as five thousand voices raise the roof with carols galore. Star guest Chris de Burgh performs his seasonal hit A Spaceman Came Travelling, and the Junior School Choir of the Year join Aled to perform Walking in the Air.